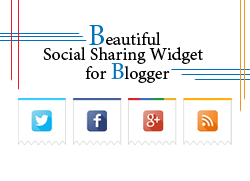 Beautiful social sharing widget for blogger. Many bloggers are like clean and simple sharing widget. You just easily implement this to your blog/website easily. How to add this social sharing widget to your blog/website? 2: copy and Paste the following below code. 8: your new social sharing widget is installed successfully! So enjoy this.